Home » Store gold in your stomach to avoid paying tax? One man did! It’s not uncommon for people to go to extreme lengths to protect their wealth. We always harp on about protecting your hard earned assets with gold, but one over-zealous investor in India took it a step too far. Gold has always been part of the DNA of Indians, but one chap took this literally. After complaining of severe stomach pains, the un-named 63-year old Indian citizen visited his local hospital to investigate the cause. Surgeons were stunned upon opening his stomach to find twelve 1oz gold bars. Apparently the patient had told hospital staff he’d accidentally swallowed a plastic bottle cap to hide the real source of his discomfort. His motivation to store gold in his stomach had been to smuggle the bars into India and avoid import duty. Unfortunately for him, doctors handed over the twelve bars, each weighing 33g, to police. Subsequently they’ve been forwarded onto customs who are conducting their own probe. Better places to store gold than your stomach? While owning physical gold bars and coins negates any counterparty risk, it also presents the challenge of storing the metal. It’s very important that wherever you choose to store your gold, you also insure it. With prospects for gold set fair for the remainder of 2014, all your prudent diversifying into gold could be undone if it is subsequently stolen and you don’t have adequate insurance coverage. whom you bought the coins or bars. Most should be able to provide specialist facilities not only to store the gold but do it in a safe way so the gold never gets damaged or tarnished. Any fee charged should also include insurance, covering the remote possibility of theft from the facility. It’s important to ensure that your gold is legally ring-fenced from other gold owners, the gold dealer and even the storage company itself. This way your holding is protected regardless of the performance of any other third party. The key phrases you should look for are that the gold is Allocated (real gold bars and coins as opposed to an electronic fraction of a huge bar) and Segregated (ring-fenced). If you’re considering investing in gold and want to save money, you may wish to take delivery of your gold direct to your home. You’ll need to call your house insurance providers to determine if there’s an additional premium to pay to ensure your holding is covered under your current policy. Some people prefer to keep them in a home safe. However, I support the theory that this is the first place that burglars check when they break in. In this case, I’ve heard of many buyers keeping their gold in obscure places around the house as they believe any burglar would never look there. Secret places vary from the bottom of a Frosties cereal packet, to hiding gold in a soup and then freezing it. Falling in between these two storage methods is keeping gold in a bank or third party safe deposit box. 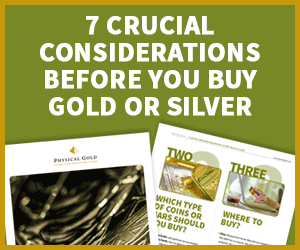 These can be cheaper than a dealer storing for you but the facility isn’t specialised in looking after precious metals which may compromise the gold. As gold ownership has grown over the past decade, we’ve also heard many stories of banks running out of safe deposit space. You’ll be relieved to know that resorting to swallowing your gold to avoid duties isn’t necessary. There are enough reputable gold dealers based in the UK that there’s no need to risk buying gold in some exotic country and smuggling it back to the UK. You shouldn’t pay any more for gold in one place to another. If you buy physical gold for investment purposes, then you should always stick to what’s known as ‘Investment Grade’ gold. This is gold of 22 carats or higher in the form of a bar or coin. This excludes gold jewellery, less pure forms of gold and gold ore or dust. The major advantage of investment grade gold is that it provides a VAT exemption in the UK. When you come to sell your gold, it is possible that you’ll attract Capital Gains Tax (CGT) if you’ve made a profit. As a UK individual, you’re currently permitted to make £11,000 capital gain in any one tax year without incurring CGT. This sounds great but the allowance is used up by all your asset sales in that year – not just gains made from gold. So if you sell shares or a second property along with gold, it’s likely that you’ll breach this threshold. There are two ways of legitimately avoiding this tax on your gold sales. You can either sell your gold strategically so that you only sell enough each tax year to fall within your threshold. Or you can simply stick to tax free gold coins such as Sovereigns or Britannia gold coins. As UK legal tender, these coins are CGT free. So if you want to protect your gold from duty and theft, it may be easier to invest in UK Sovereign coins and store gold in a precious metals depository. Otherwise, you may develop quite a stomach ache! Can I put gold in my Super ISA?